Santa Elena de Uairen – On Monday, Venezuelan president Nicolas Maduro announced his approval of a workers’ proposal to increase the minimum wage by 15% starting December 1st. This marks the third hike in salaries approved in 2014, making the current minimum wage 64.5% higher than at the start of the year. However, this latest announcement brings workers’ salaries just above the rate of inflation, which reached 63.4% during that same period. An additional adjustment to the denominator used to calculate food tickets, which are mandatorily issued by employers and used like cash at most major supermarkets, increases workers’ access to items hardest hit by inflation. The adjustment raises the allotment from 0.5 UT to 0.75 UT, which converts to about 95 bolivars (U$15) daily for food. The measures come just before the holiday season, whereupon employers are obligated to pay three months wages as an end-of-year bonus. Last week’s launching of the Happy Christmas 2014 Plan dovetails into the government’s economic strategy to improve affordability of key items and stimulate the consumption of nationally-produced products featured at nationwide fairs in preparation for the holidays. This morning, nearly US$450 million dollars were allotted to 313 companies at the preferential rate of 12 bolivars to the dollar, in a massive effort to provide importers with enough resources to combat scarcity. The receiving companies were primarily importers of automobiles and car parts, construction materials, home appliances, medicines, and paper products. 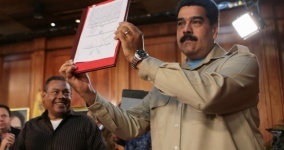 During yesterday’s event, Maduro also signed an act which implements a commission for the discussion of collective contracts for public administrative workers. The document was written and upheld by the Workers’ Social Process minister, Jesus Martinez, the president of the National Federation of Workers in the Public Sector, Franklin Rondon, and the vice minister of social planning, Lidice Altuye. Meanwhile, the Bicentenary Bank, formed in 2009 by the merging of three nationalized banks, has been absorbed by a new initiative called the Bicentenary Bank for the Venezuelan Working Class. The 536 currently functioning agencies will now offer specific services directed at clients earning the minimum wage and their families, including high-yield savings accounts. The worker’s bank is also meant to accelerate applications for housing credits. The Venezuelan leader closed the ceremony after highlighting official data which indicates current unemployment rates are at the lowest they’ve been for 40 years.